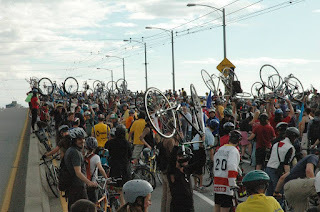 On Friday Feb. 22nd, join fellow bicyclists and other self-propelled folk for a ride that celebrates the vision of a healthy and abundant tomorrow. 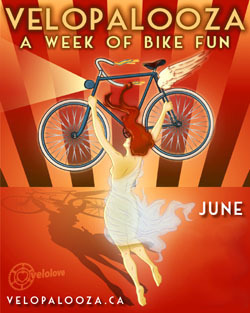 This month's ride is special, as it coincides with the NEB Day of Action (*). Since that rally will be winding down soon after our ride starts, we'll make that our first point of call, whether as a ride-by or a stop-over. As a Critical Mass, we can then carry the torch of awareness and solidarity onwards! Wear as many lights as you can, and bring noise-makers! As per always, we'll meet at the Vancouver Art Gallery on the Georgia Street side between 5:30 and 6:00pm. At 6pm, we roll! The ride is on rain, shine, or snow. Costumes and decorated bicycles, trailers, signs, flags, gettoblasters, sound systems, drums, and wildly modified bicycles are all highly encouraged. Invite your friends, colleagues, and family! Spread the word! The ride will end at the Brickhouse (730 Main St at Adanac). 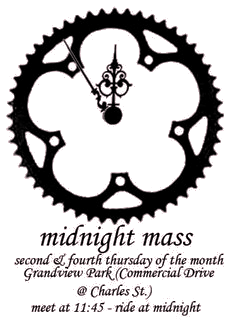 Feel free to join us there (8:00pm) even if you can't make the ride. Meet outside the Vancouver Office of the 'National Energy Board' (800 Burrard St. @ Robson St.) at 4:30 pm, then march to the CBC Building (700 Hamilton @ Georgia) for the rally program at 5pm. United for People and Planet! No Trudeau Pipeline Expansion! Please pass this message on to others! If you can go to the 4:30pm event, please go! Bring your bike and join the critical mass after the rally ends.